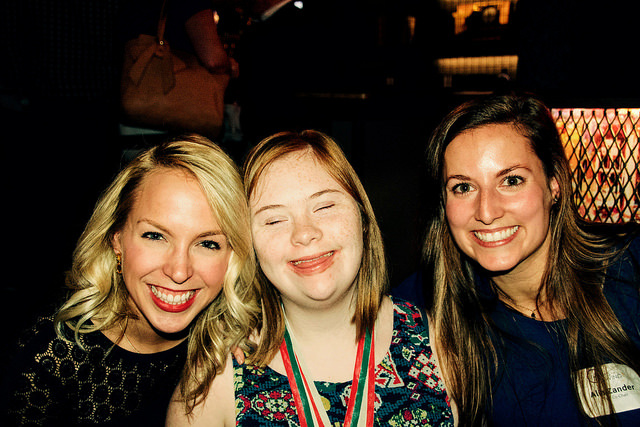 The Young Professionals Board (YPB) of Special Olympics Illinois hosted their sixth annual fundraising event to benefit the athletes in the Chicago/Area 3 program. “Thanks-for-Giving”, a wine and beer tasting event was held at Public House in Chicago on November 17. More than 140 guests enjoyed the evening, which included tastes of many delicious varieties of wine, beer and champagne. Abundant hors d’oeuvres and desserts were available throughout the night. The event was planned by a committee of YPB volunteers and was chaired by Carly O’Toole and Alia Zander. Additional committee members include Kaitlyn Rosen, Lauren Snider, Lynda Judy, Patty Kernan, Allie Kerr, Carrie Brate, Erica Behm, Melissa Evans, Jake Abrams, Julie White, Kayla Ellsworth, Mae Rodovich, Lindsey Schneider, Melissa Silverman, Ryan Lieberman, Sean Regan and Mary Kelly. Generous donors contributed to a raffle and silent auction, which included gift cards for dinner, theater, and hotel accommodations, sports tickets and destination packages. The event earned more than $15,500 to benefit Special Olympics Area 3.